Students who have established credit for a Purdue math class (via AP, IB, transfer, or dual credit) are typically placed into an appropriate math class in their first semester based on that credit. If you have an SAT Math score of at least 670 or an ACT Math score of at least 29, then you do NOT need to take ALEKS in order to register for a math class for the upcoming semester. If you have neither an SAT Math score of at least 530 nor an ACT Math score of at least 21, then you must obtain an ALEKS score of at least 45% before you can register for a math class for the upcoming semester. (This is also true of students who do not have an SAT/ACT score). If you have an SAT Math score in the range 530 to 660 OR an ACT Math score in the range 21 to 28, then please examine the table below to determine IF you must take ALEKS in order to register for your desired math class at Purdue. Students may place into the classes shown in the table below in one of three ways: with a suitable score on the math component of either the SAT or ACT or with a suitable score on the ALEKS Placement Assessment. (See the documentation below for more information about ALEKS.) Because math requirements vary greatly among majors and colleges, students are encouraged to consult the University course catalog and look at the plans of study they are considering to determine which initial math class they should take. Individuals who have further questions may contact their college’s advising office. Who should take the ALEKS Placement Assessment? The ALEKS Placement Assessment covers material from basic mathematics through precalculus and will take approximately 90 minutes to complete. 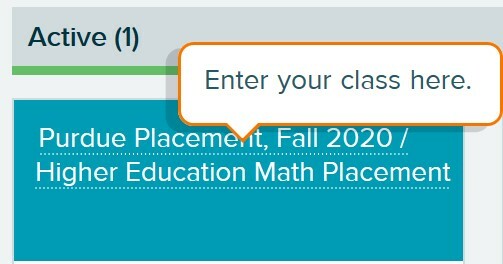 If you already have an SAT Math or ACT Math score that meets or exceeds course requirements listed above you do not have to take the ALEKS Placement Assessment to place into a mathematics course. Even if you place into your desired mathematics course with your SAT or ACT scores, all students are able to take the ALEKS Placement Assessment and use the learning modules. There is no penalty for taking an ALEKS assessment as you can use your qualifying score in either ALEKS, SAT Math, or ACT Math for placement. It is important that you relax and that you are honest about your skill level. Therefore, while you are taking the assessment, do not consult any other source for help. Remember, you not only want to get into the right course, you want to be very successful in that course. This is simply an assessment, not a test. The difference is that an assessment is designed to determine what you know in order to best serve your academic success at Purdue University. At the end of the ALEKS Placement Assessment, you will have a much better sense of your strengths and weaknesses in math. You will then have a chance to work on those weaknesses through a targeted Prep and Learning Module geared to your goals to improve placement and eventual course outcomes. What if I'm not sure I need to take ALEKS? Take it anyway! It’s free and it can’t hurt anything. A low score does not negate your SAT or ACT scores. Go to the ALEKS website via this link. Is there a fee for using ALEKS? No, ALEKS is free. This includes everything. Yes, you may take up to 5 placement assessments. However, to make each attempt worthwhile, it is important that you spend time working in your ALEKS Prep and Learning Module in between placement assessments so that you can improve your skills. Only the highest ALEKS score is used for placement. Are ALEKS Placement Assessments proctored? No, you are on your honor to take the assessment without assistance. ALEKS will provide an on-screen calculator if you need one to complete a particular problem. You may also use a single-line calculator. No graphing or two-line calculators can be used. You may only use a pen or pencil, paper, and the resources provided by ALEKS. You may not receive assistance from friends, family, other websites, textbooks, or any other resource not provided by ALEKS. Using outside resources will lead to improper placement and ultimately course failure. Remember, your goal is to be successful in your first math course. You must wait 24 hours between placement assessments. There is generally no benefit to re-taking the assessment immediately after completing a prior attempt. Unlike the SAT or ACT, you cannot improve your results by simply re-taking the assessment without spending time in the Prep and Learning Module to refresh material that you may have forgotten or to learn new material. 2nd: Before taking your 2nd placement assessment, you must wait 24 hours. 3rd/4th: Before taking your 3rd and 4th placement assessments, you must wait 24 hours and spend 3 hours in a Prep and Learning Module. 5th: Before taking your 5th and final placement assessment, you must wait 24 hours, spend 3 hours in a Prep and Learning Module, and contact Tim Delworth at delworth@purdue.edu to receive a password to open up your last assessment. Yes, you have 48 hours to complete a placement assessment once it has begun. You can take a break, however, if you wait more than 48 hours you have to start a new assessment and it will not count as one of your five attempts. Placement assessments require approximately 90 minutes to complete, but the amount of time will vary by student. We suggest you set aside two hours. There will be a maximum of 30 questions. See the table of scores required for mathematics course placement or your advisor for more information about how Purdue uses your ALEKS scores. ALEKS will begin with a brief tutorial before your placement begins. While working in a Prep and Learning Module, you will periodically complete progress assessments to solidify your gains in knowledge. No, you must complete a new placement assessment to change your placement result. Click on the placement tab on the upper right of the page from within ALEKS. Only your placement assessment results will be used for course placement. Which Prep and Learning Module should I choose? There are two to choose from. You should pick the one that matches the course description of the math course you are attempting to enroll. Can I change to a different Prep and Learning Module later? No, you may only use one Prep and Learning Module. Choose wisely. Congratulations! Continue to use your Prep and Learning Module to improve your chances of success. The placement result above is the minimum preparation required for your course! 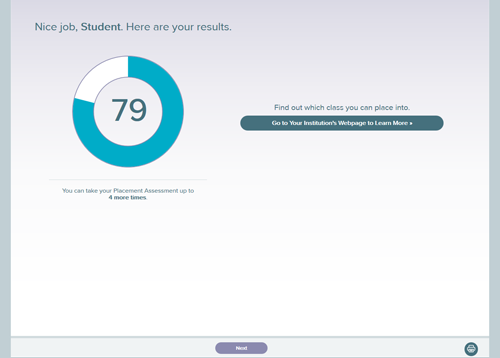 Take advantage of the targeted review and learning features in ALEKS to get a better grade in your class. What about Advanced Placement (AP) credit? You may still need to take ALEKS. However, all questions concerning advanced placement credit and the role of ALEKS in placement in non-mathematics courses should be directed to your advisor. I have read everything and I have one more question. If you have any further questions, please contact Tim Delworth, delworth@purdue.edu. No phone calls, please.